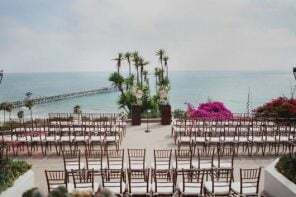 Our average base cost for a Cal-a-Vie wedding is calculated by figuring a 120-person guest list for a Saturday ceremony/reception and a food/beverage cost of $250/pp. Entertainment, flowers, additional decorations and rentals, transportation, and photography are NOT included. Price is rounded up to the nearest thousand. Gratuity and sales tax is included in our average base cost. 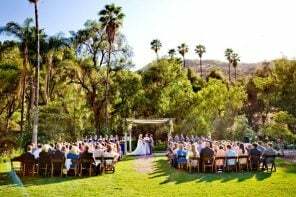 Facility Rental Fee: There is a wedding venue fee of $15,000 plus tax. A 3-day buyout of the property is also required, which breaks down as follows for each guest. 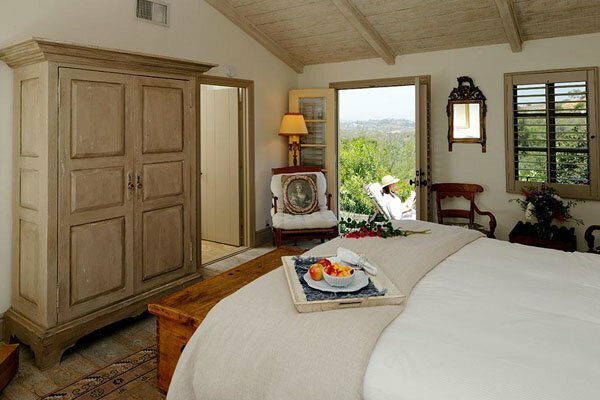 Package rates are based upon the number of rooms secured, with a minimum of 26 rooms. The maximum overnight capacity is 64 guests (including children). Additional accommodations may be arranged with a local preferred resort. Transportation from San Diego or Carlsbad Palomar airports. 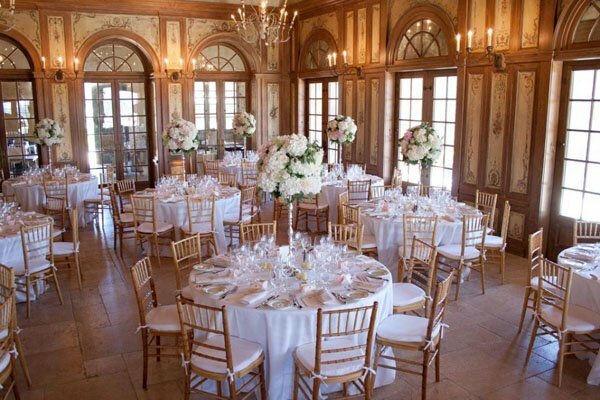 Décor, including 60” round tables, votive candles, Chiavari chairs, white linens, china, flatware, glassware and dance floor. 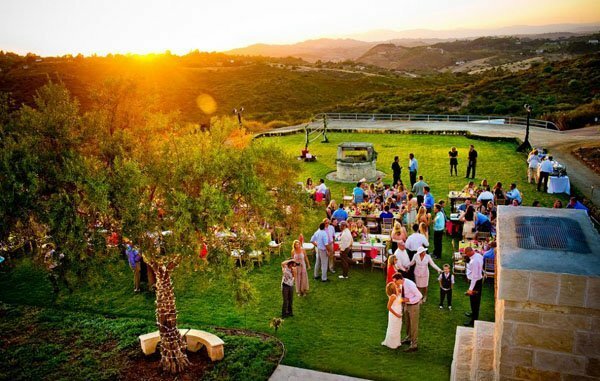 SEE MORE: View our other favorite San Diego Wedding Venues here! Food and Beverage: You must use their in-house catering. Their pricing for a three-course meal and full bar averages $250/pp, not including tax and service. Other Vendors: Cal-a-Vie allows outside vendors for everything but catering. Space Type: Inside/Outside. 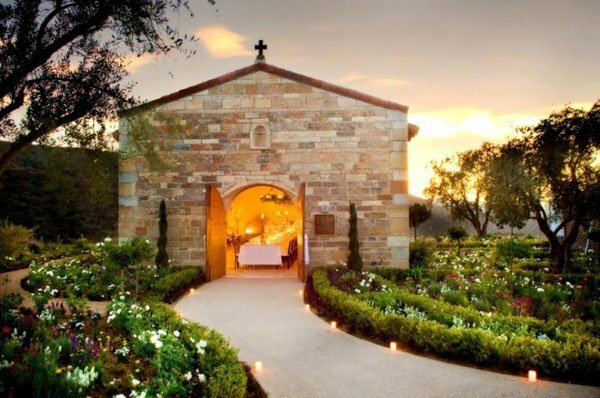 There is a 17th century candle-lit Chapel and L’Orangerie reception hall. Parking: Yes. Valet service is included in the venue fee. How Will Grandma Get There? Ideally Grandma would stay on the property. Other nearby hotels include The Residence Inn Marriott and the Golden Door. 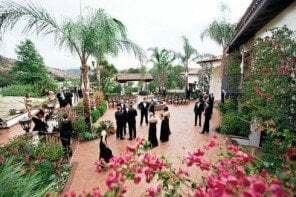 The venue is 45 minutes from the San Diego International Airport and downtown San Diego, where guests could also choose to stay. Party On! Events can go until midnight. 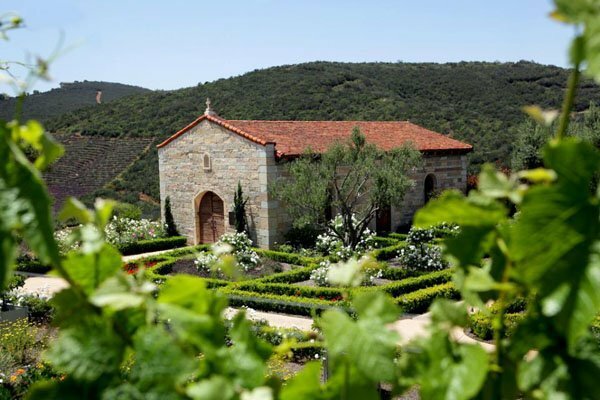 Located on 200 acres, Cal-a-Vie offers a unique, all-inclusive 3-day destination wedding experience for up to 120 event guests at their award-winning destination spa located in the countryside of Northern San Diego County. 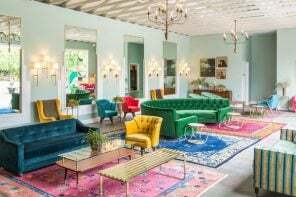 They can accommodate up to 64 in-house guests for their 3-day spa experience with a required minimum of 26 in-house guests for all weddings held on the property. 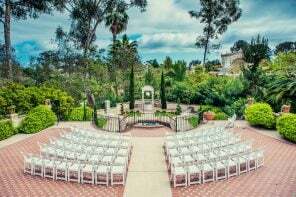 With a 400-year-old Chapel originally built in Dijon, France for your candelit ceremony, followed by a reception either in their 300-year-old French L’Orangerie reception building or outside on the L’Orangerie Lawn with views of Vista Valley, the property features the oldest buildings in San Diego County and reflect the history and ambience of a French Provencal village. 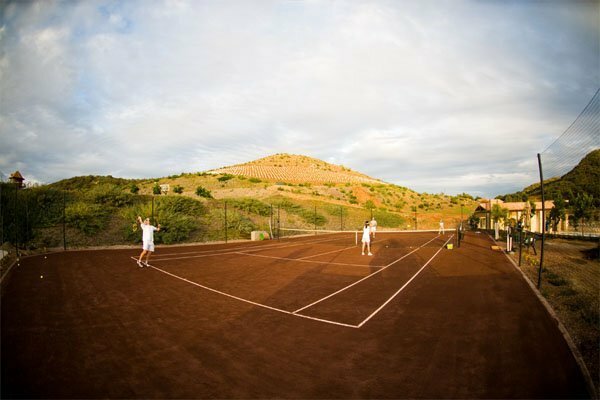 In 2015 the resort was ranked the No. 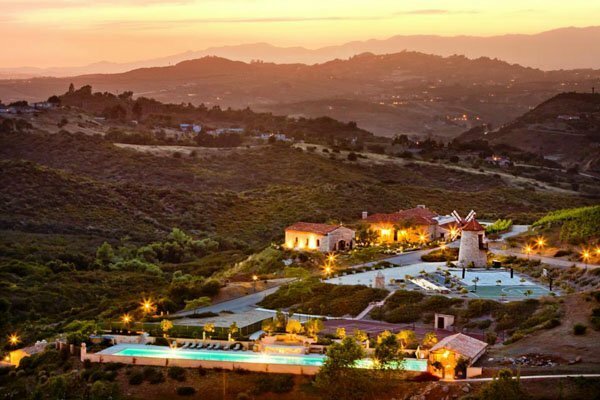 1 resort in Southern California, No, 2 resort in the country and No. 6 resort in the world by Conde Nast Traveler. OK brides. Unless you have a big venue/catering budget, look away now! This will only make you sad. 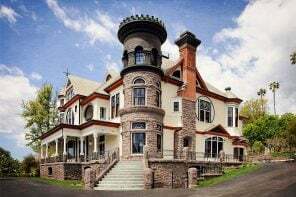 Yes, this property is G-O-R-G-E-O-U-S and is basically a dream destination wedding location, but you (and in particular at least 26 of your guests) have to have the budget for it. 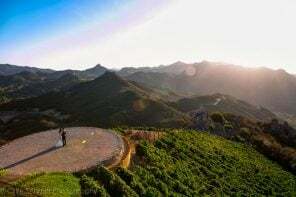 While the all-inclusive package price seems pretty hefty at first, it’s comparable to what it would cost you at other top-rated Southern California resorts if you elected to have all the extra-curricular activities they offer as well as food and spa treatments (for instance, a 3-night stay at San Ysidro Ranch would run you the same per-person price if you included options such as the ones they have here). 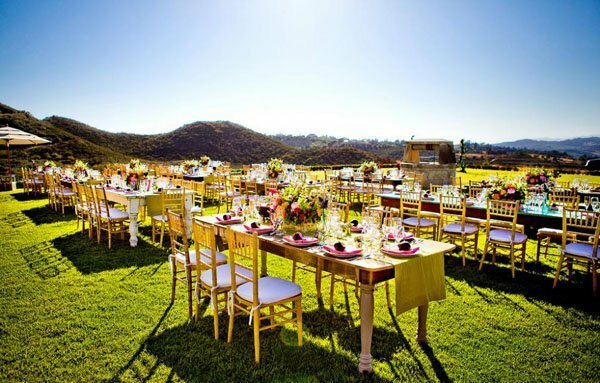 With that said, if this is do-able for you and your guests, then I love this wedding venue for you. 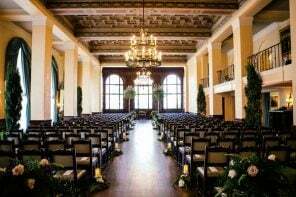 They actually include a lot in their wedding venue rental fee and you would have to bring in very little in terms of wedding decor…just add flowers! 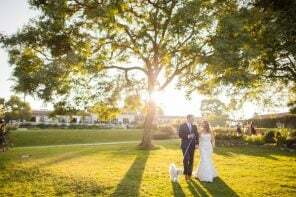 Discover more wedding venues here.